Everyone who has experienced Italian hospitality would definitely agree that it’s always followed by lots of hot, mouthwatering food—like pasta! Italians eat it every day, mostly at lunch; so if you happen to be touring this beautiful place and want to avoid traffic, remember to travel between 12 and 2 pm. You will find there aren’t too many vehicles on the roads because Italians are either home or in restaurants enjoying their lunch. 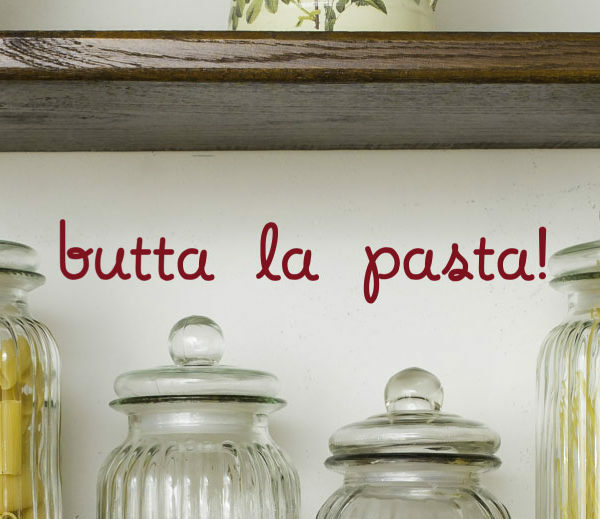 They take pleasure in this particular time of the day and often use the popular phrase, ‘Mama, butta la pasta!’ which means ‘Mom, throw the pasta (in the pot)’ implying that one will soon be home for lunch. Pasta is such a well-loved food because it’s delicious and satisfying; and you can do so many things with a basic recipe. Most moms like us have special pasta dishes we lovingly prepare for our families — spaghetti, lasagna, fettuccini, ravioli and even mac and cheese and pizza! Nothing ever beats a freshly-cooked, nourishing home-made meal! 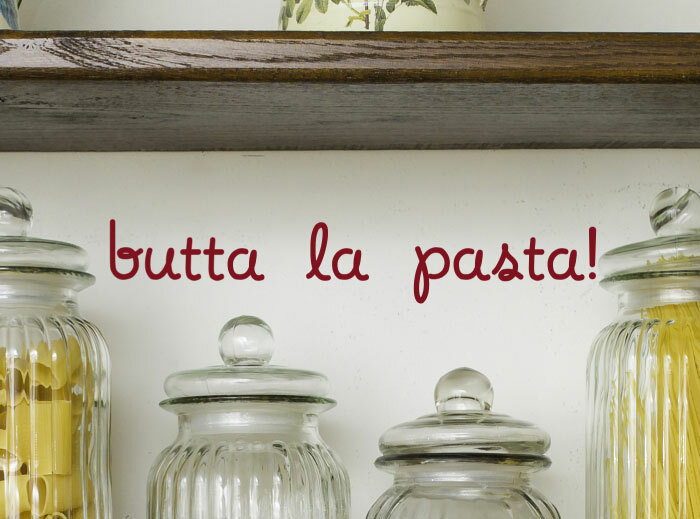 We take our hats off to the Italians for creating so many of these wonderful recipes and what better way to honor their food artistry than to ‘spice up’ our pasta shelves with the wall words ‘butta la pasta!’ This burgundy wall quote in noodle script lettering style will be a nice touch to every pasta-loving family’s kitchen. Open shelves is a creative solution to make your kitchen look more spacious and like what we have in this picture, using rich dark-toned wood on a crisp white wall puts together a stylish set of shelves. For an even more striking look, you can add personal collections like decorative metal watering cans, baskets, and other choice accessories — you already have at home. 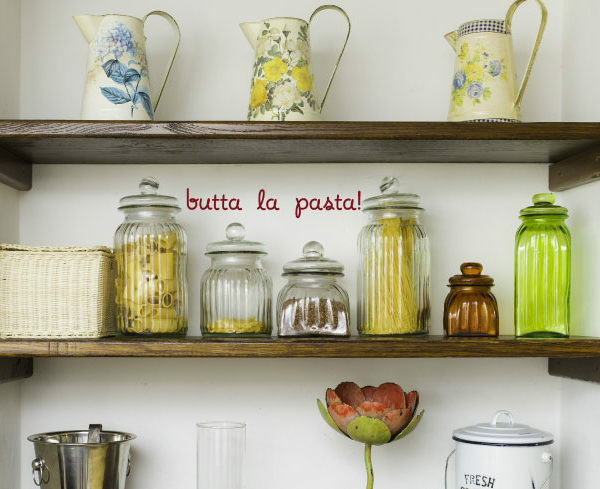 Using fluted glass containers with lids — or even repurposed glass jars! 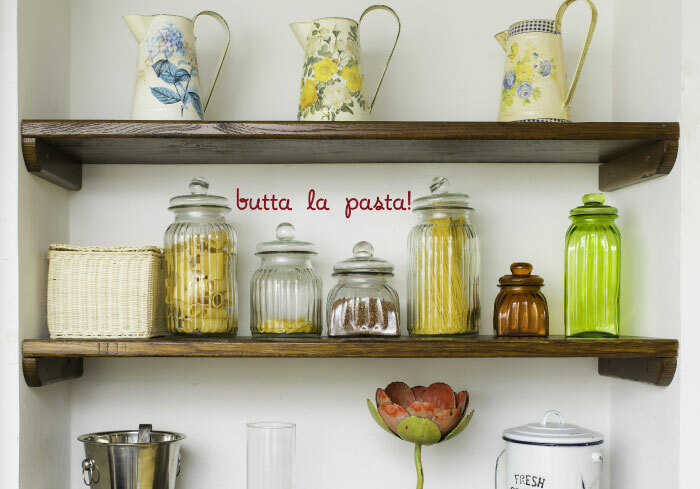 — is a wonderful way to display your pasta. Coupled with practical and effective design ideas, wall words are a fresh, innovative and economical way to quickly spruce up any room in your home. Let your walls do the talking with quotes that express your character and personal style. Browse through our wide collection of kitchen quotes and you will discover that we have something for everyone. 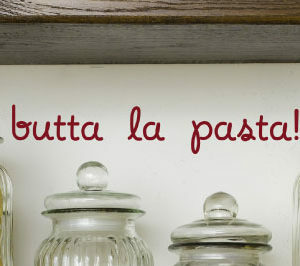 Check out categories like ‘for the chef’, ‘for the foodie’, ‘table graces’, ‘humor and wit’, more Italian sayings and other kitchen quotes. DecorativeLettering products are both available in wall decal and reusable stencils. Wall decals are your answer to fast an redecorating home re-decorating. Expertly made from top-quality durable resins, they are a breeze to apply, easy to clean and will last you many years. On the other hand, we suggest reusable stencils if you desire the authenticity of fine hand-painted art in designing your spaces. These offer you the benefit of applying your wall word decor to textured and other paintable surfaces around your home — and you can even share these with family and friends! While you’re here, you might want to subscribe to our monthly newsletters where you get the latest news on our limited-time only deals (usually at 25% off) on choice designs. We also give free shipping coupons and feature innovative ideas on home make-overs using decorative lettering. Please click on our ‘Get specials & Ideas monthly’ tab on the upper part of this page to take advantage of these special offers.